NEW ORLEANS – Tomorrow is Friday! While some may look at Friday as the final day of the work week, coaches wanting to take advantage of the early registration period for the 2018 USTFCCCA Convention need to kick it into high gear, like more than 1500 coaches already have. Early registration ends tomorrow night at 11:59 pm ET. If registered before the clock strikes midnight on December 1, the price is $375 compared to $450 ($75 increase). Payment for the 2018 USTFCCCA Convention can be made by credit card (VISA, Mastercard, American Express or Discover) or through check and money order. If paid by check or money order, the envelope must be postmarked by November 30 to be considered early registration. As part of registration, coaches have access to breakfast, lunch and dinner on Tuesday, Wednesday and Thursday as well as admission to every major event, including the USTFCCCA Coaches Hall of Fame Induction and The Bowerman Presentation. Also, if you have not made your hotel reservation yet, the JW Marriott San Antonio Hill Country Resort & Spa (where all Convention activities will take place) and the Courtyard by Marriott San Antonio North/Stone Oak at Legacy have each sold out on AT LEAST one night of Convention. We encourage you to book your room now at the Hyatt Place San Antonio North Stone Oak. Shuttle transportation will be available from both to and from the Courtyard by Marriott San Antonio North/Stone Oak at Legacy and the Hyatt Place San Antonio North Stone Oak to the JW Marriott San Antonio Hill Country Resort & Spa. 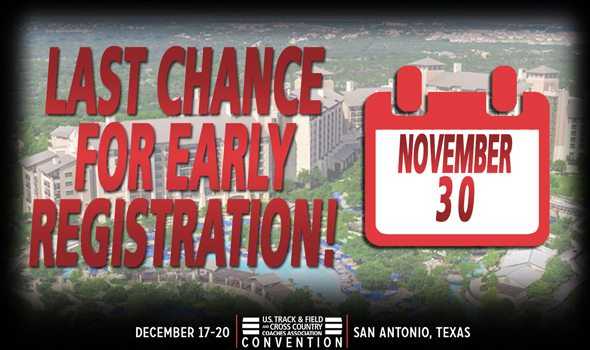 The 2018 USTFCCCA Convention will be held December 17-20 at the JW Marriott San Antonio Hill Country Resort & Spa in San Antonio.